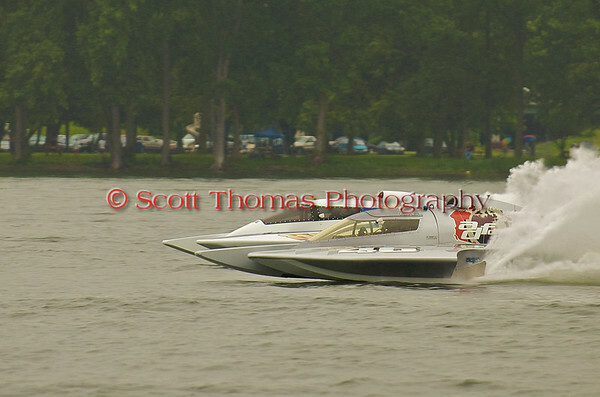 Last Saturday I attended Syracuse Hydrofest featuring Inboard Hydroplane racing. All boats use propellers with the Grand Prix class reaching speeds up to 175 miles per hour (282 kilometers per hour). The day was rainy and grey causing the day to start late and ending early after only a few races due to visibility and a serious accident. However, I did get to go out on one of the turn boats on the course and bring back a few photos I’d like to share with you here. Miss Dinomytes (GP46) driven by Pierre Maheu from Quebec, Canada, chases down the leader durng a Grand Prix Hyrdroplane heat during the Syracuse Hydrofest on Saturday, June 20. 2009. Rolling Thunder (GP88 on the outside) and Miss Dinomytes (GP46) race for the lead. 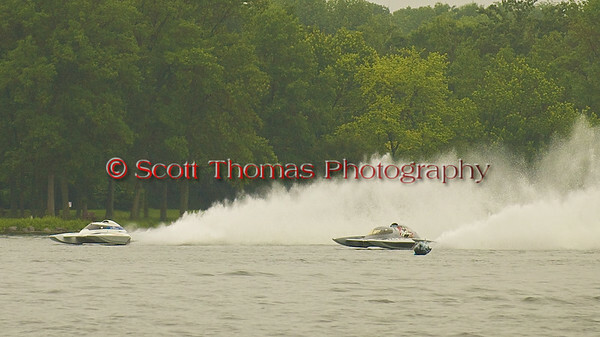 This entry was posted in Sports and tagged 70-200mm, hydrofest, hydroplane, new york, nikon, Onondaga Lake Park, Photography, racing, speed, syracuse, vr, water. Bookmark the permalink. THAT looks like a fun event! Great captures. Would have been more fun if they had gotten going in the morning as scheduled. I had to miss Sunday which was the better of the two days weatherwise. The people running the event were very nice to let me in the pits and out on the course. I hope to be able to do it again next year. Now, now…motorsports is still very popular. I do wish they would be more proactive in using alternative fuels like the Indy series does. Someday, someone is going to listen to me and invest in Hydrogen as the fuel for the future. So far, only Honda has produced an H2 car. Great shots Scott, they can really be a blast to watch ! !